I believe in fate. Today fate intervened and I was able to help another creature and hopefully save its life. Most days I take a “back way” home after dropping my daughter off at preschool. It gives me the chance to stalk wildlife and our twins a chance to nap in the car. It’s a win-win situation! Today I was driving one of my many favorite routes when I saw a bird “dead” in the road ahead. 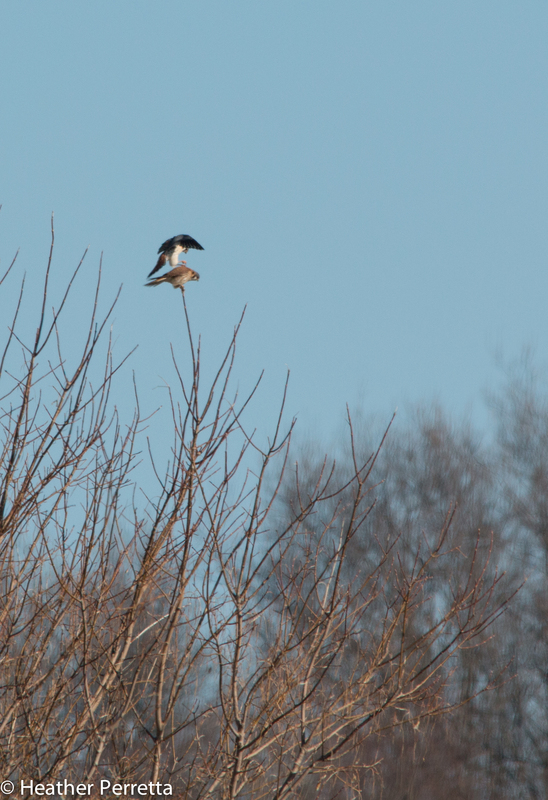 It was a northern flicker. I have always felt that animals deserve better than to become part of the pavement and I often stop to move dead things to a better resting place. I pulled over to do just that. When I approached the flicker it was not moving and there was a half-dollar sized puddle of blood under its head. I bent down and reached out my hand to touch the silky feathers. As I did the flicker flew off the pavement straight for my head. I was quite shocked as I watched it fly about 15 ft where it crashed into a bush. I went into the brush after it and made another failed attempt to capture it. Then I had an idea. I grabbed a bag out of the backed the car. I went to where the exhausted bird was laying on the ground. I covered the bird with the bag and carefully picked it up. Holding it snugly I went back to the car. Now that I had the bird I had to figure out what to do next. My first thought was to consult some people that used to be wildlife rehabilitators. I went to their house and they were not home. 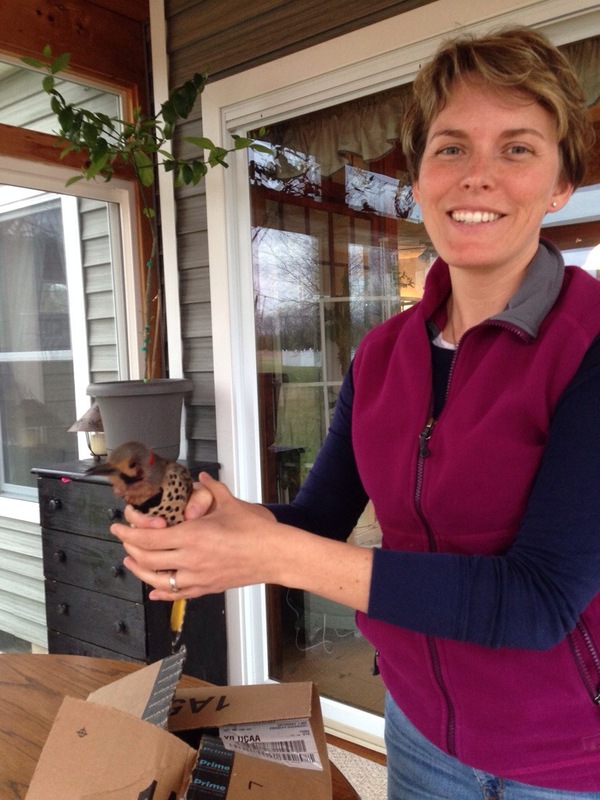 My next option was to call another wildlife rehabilitator who is farther away. I called her and she instructed me to let the bird rest in a cardboard box until tomorrow. I asked about the bleeding and she said that I could clean the wounds with a little warm water. I did just that. I put paper towels in a box. I got some warm water and cotton balls. When everything was ready I carefully but firmly picked the flicker out of the bag. When I took him out of the bag I noticed the black marks on the side of his face. They look like a mustache and I knew from that that he was a male. He was nervous and I talked to him as I worked. The warm water seemed soothing. 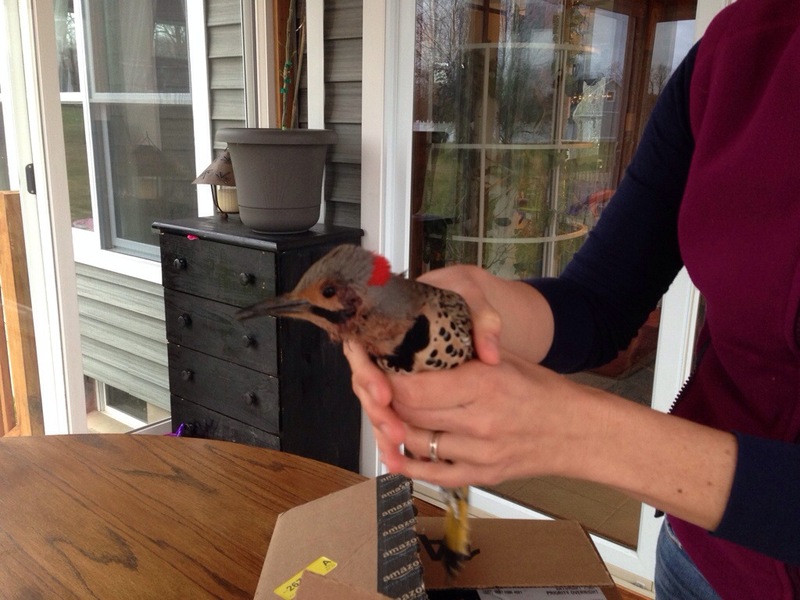 He fluffed his head feather, closed his eyes, and tilted his head so I could clean the wounds. First one side and then the other. I gave him a few drops of water and settled him into the box. 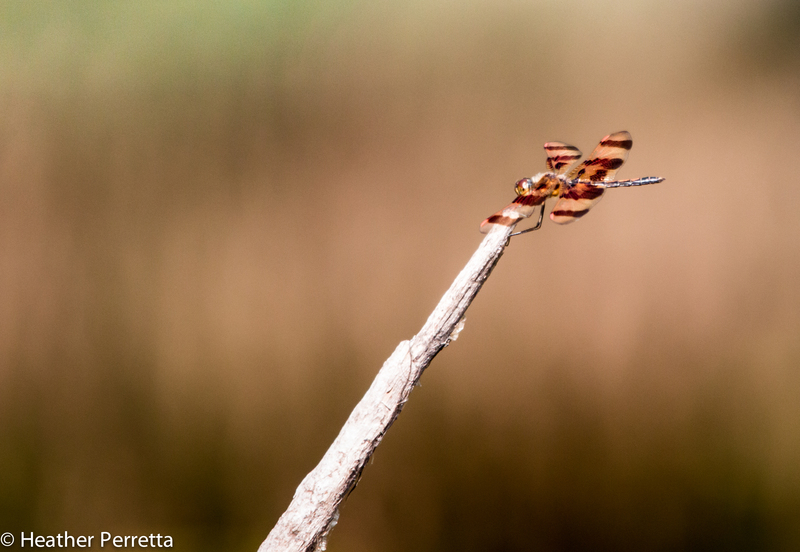 He needed rest and I was hopeful that he would be able to fly away tomorrow morning. When I checked on him this evening it was clear that he was not interested in remaining in the box. As soon as there was a little light shining through the corners he was poking his beak out trying to escape. I opened the box slowly and picked him up. We took a coupe pictures. I walked outside and opened my hands. He immediately took flight and landed, not that gracefully, in a nearby tree. His second landing was better and by his third take off and landing he was looking good. Good luck to you dear flicker. I’m grateful for the opportunity to help you today and hope that my intervention made a difference for you. You can watch the video of his release by clicking here. I have two main study areas that I visit on a daily basis. The first area is the edge habitat along the road where I live. 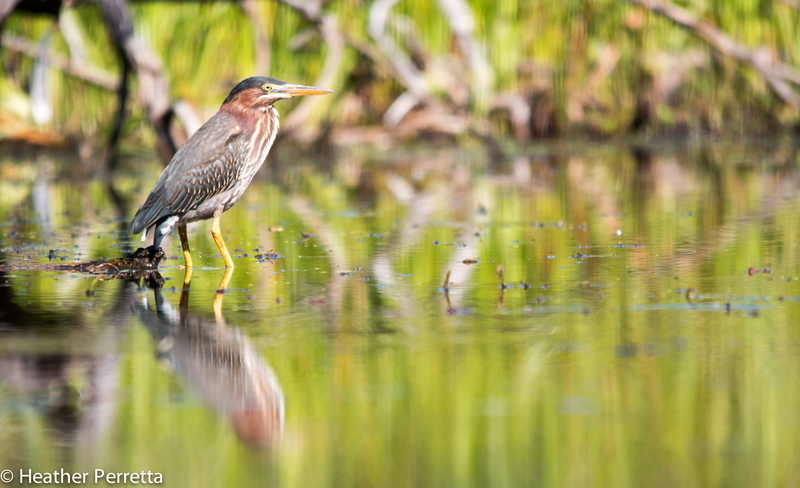 There are wooded areas, open lawns and fields, and wetlands. The second area is a wide expanse of grassland comprised of many different agricultural fields with various purposes. Having places that I visit daily to learn about the biodiversity and ecology of the area satisfies the scientific part of my brain and at the same time it feeds my soul. I quietly observe and make mental connections while the magic and beauty of nature reveals itself. There is something powerful about coming to know a place on that level. The world rushes by and I am still, wrapped up in the magnificence of the unseen world. 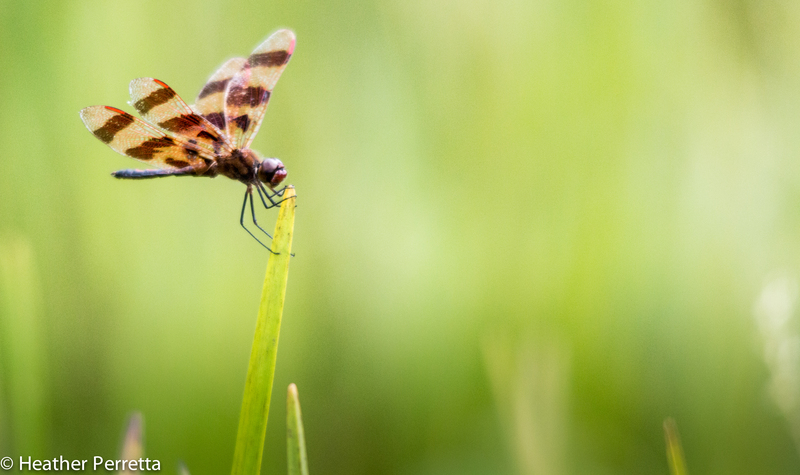 The more I observe the grassland habitat, the more I realize how fragile it is. Most of the species that I see live on grazing land or in fallow fields the status of which could change at any time as land is sold and new crops grown. Tonight I added to the list of species I have observed that are dependent on this land remaining as it is. As I drove down one of my favorite roads tonight I was using my peripheral vision to scan for northern harriers and short-eared owls. I usually drive with at least one window down so I can hear what is going on in the fields and tonight I heard the most peculiar sound. Click on this link to listen to what I heard. 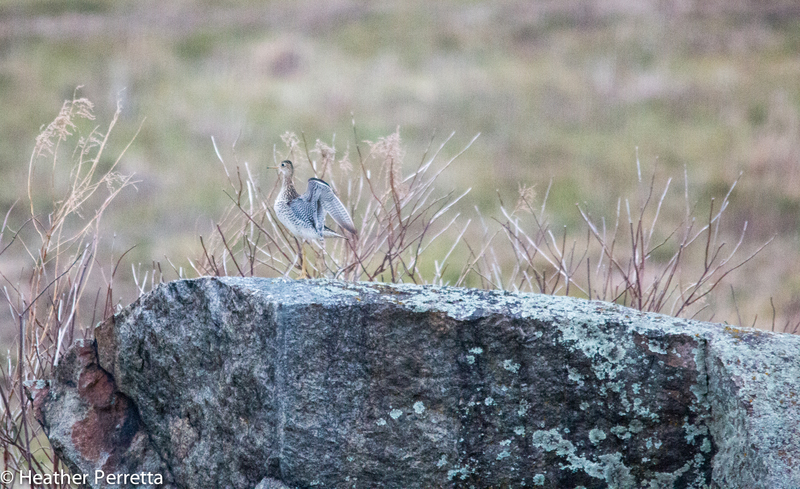 After searching for several minutes I spotted this beautiful upland sandpiper on a rock. It was calling loudly and I heard another off in the distance occasionally singing their wolf-like song. The sandpiper that I observed spent quite a long time on this rock calling, running back and forth, and holding its wings up off its back. After watching for about 30 minutes it flew off into the field. I turned around and drove back by a little while later. I spotted two sandpipers foraging and running about in the field. Upland Sandpipers are speckled and well camouflaged. This sandpiper went back and forth on the rock keenly observing its surroundings. In addition to calling and pacing the sandpiper also stood with its wings off its back. This wasn’t a precursor to flight nor was it right after it landed. It simple called and lifted its wings. 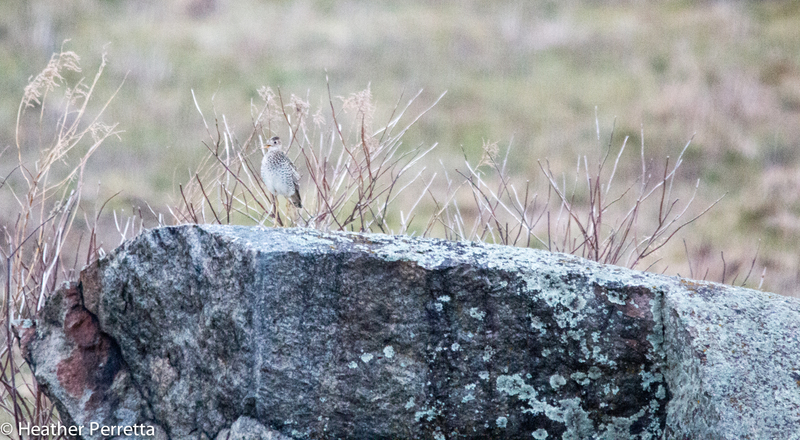 Upland sandpipers are prevalent throughout the US but limited to only two main areas in NY. According the the DEC website upland sandpipers are limited to the St. Lawrence Valley in Jefferson County and the Mohawk Valley. Despite my study area being north of the valley there were at least two in a field tonight where I study. The number of upland sandpipers has been declining for decades. At one time they were common and widespread in NY. Now they are considered uncommon breeders mainly due to habitat destruction. 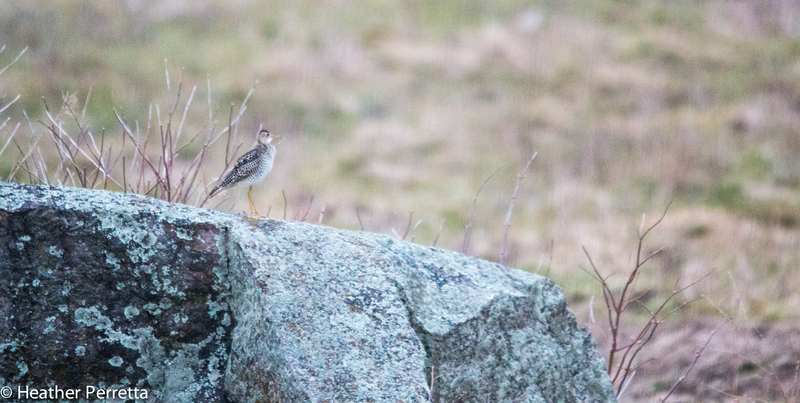 It will be interesting to see if these upland sandpipers are here to breed or if they are just passing through. 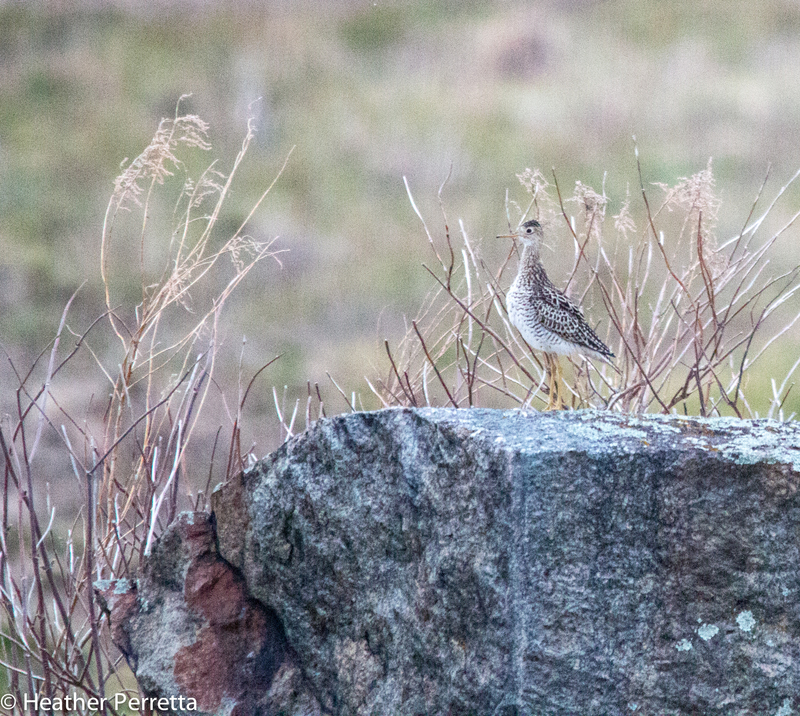 Here are two links to additional information about the upland sandpiper. It was a bright sunny evening tonight as I left the house on my normal evening drive. A neighbor called earlier today and mentioned that he saw some unusual ducks on a pond down the road so I decided to take a different route to survey the area. I didn’t find those ducks and what I saw I would have never imagined. The first thing I spotted tonight was a pair of beautiful wood ducks on a beaver pond. These were not the ducks my neighbor told me about but I was glad to see them because I love wood ducks and they were in a beautiful setting. I have mentioned in other posts that northern harriers are everywhere I look these days. Tonight was no exception. 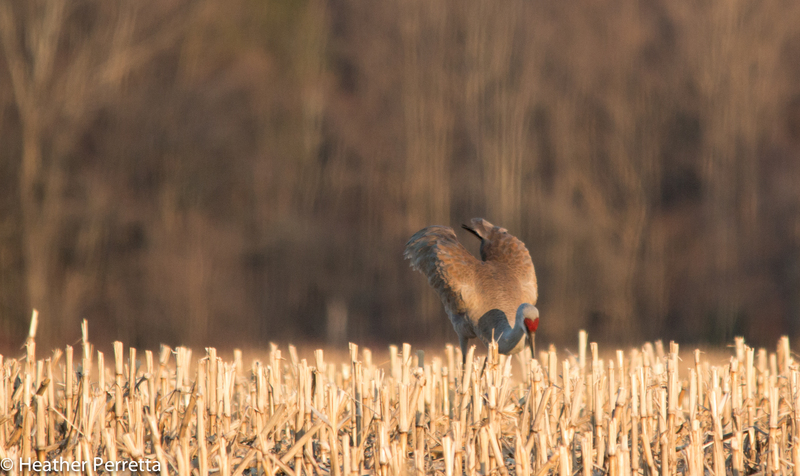 First I saw a male working a field for food and then a female quietly preening on the ground. 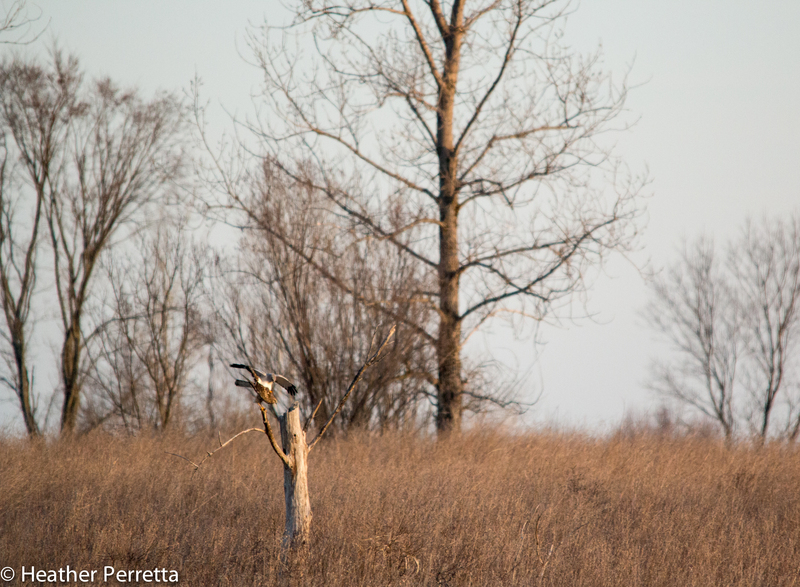 I watched her for quite a while and then decided to continue my exploration in hopes of seeing a short-eared owl. 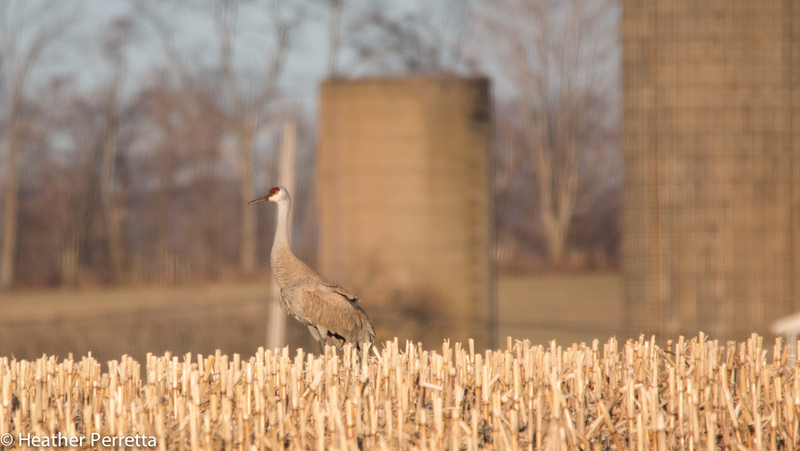 As I approached a large cornfield I saw very tall gray bird. My intuition immediately said “Sandhiill Crane” and my mind followed that up with “Yah, right! 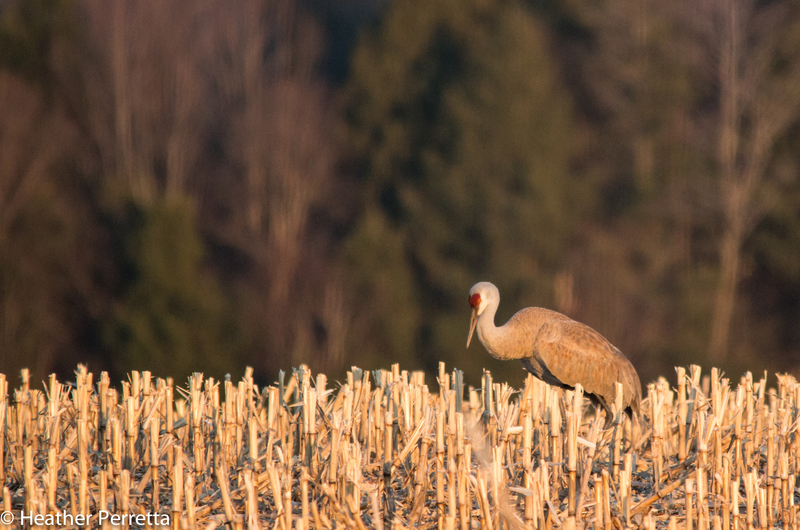 Sandhill crane? Are you nuts? It must be a Great Blue Heron.” I pulled up a little closer so that I could get a look at it without disturbing it. 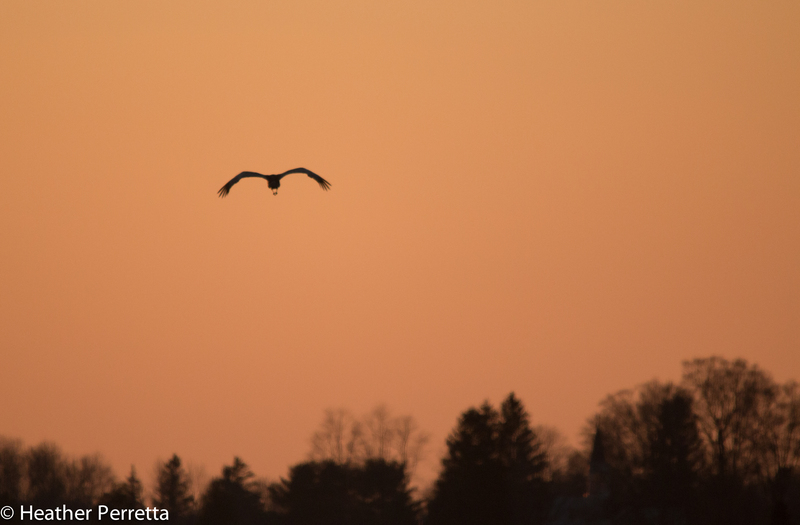 I know herons can be flighty and I wanted to get a good look and some pictures before it took flight. I grabbed the binoculars and what I saw took my breath away! 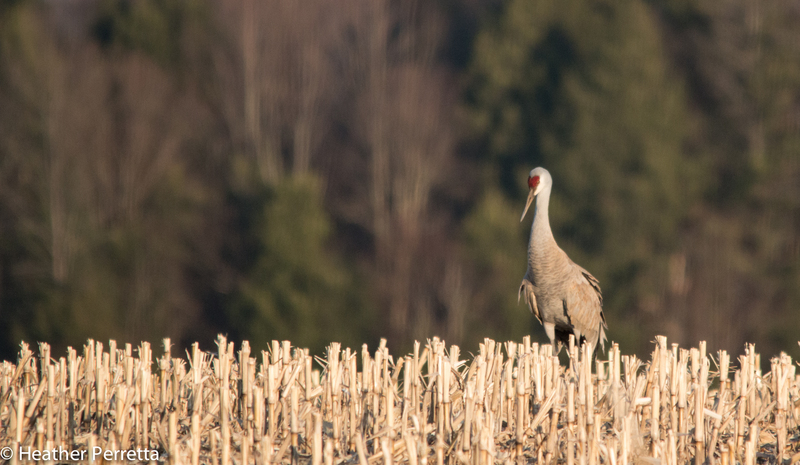 A tall gray bird with a red patch on its head, a Sandhill Crane! I immediately put the car in park, jumped in the passenger seat and started taking pictures. I knew if I didn’t get some images no one would believe what I had seen. 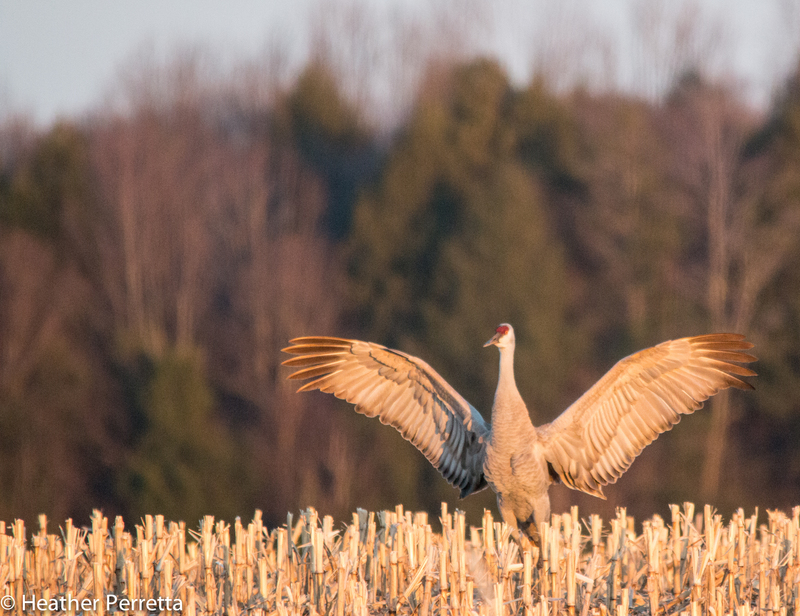 I sat observing, photographing, and soaking in the grace of this magnificent bird for almost an hour. 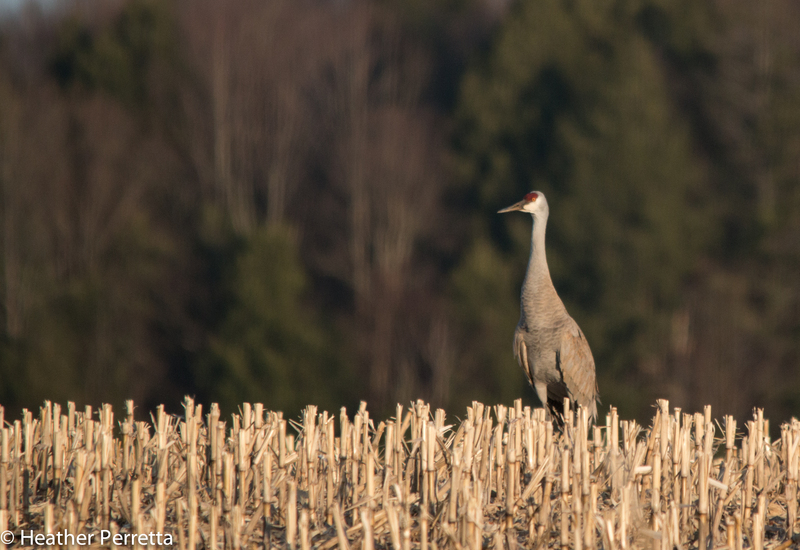 At one point I repositioned the car as the crane had meandered away while nibbling on corn in the field. It seemed aware and watchful but not disturbed by my presence. It ate, it preened, it looked about. Initially my adrenaline was pumping and I rested the camera on the window opening in the car door to steady my nerves and support the camera to stop some of the shaking of my hands. 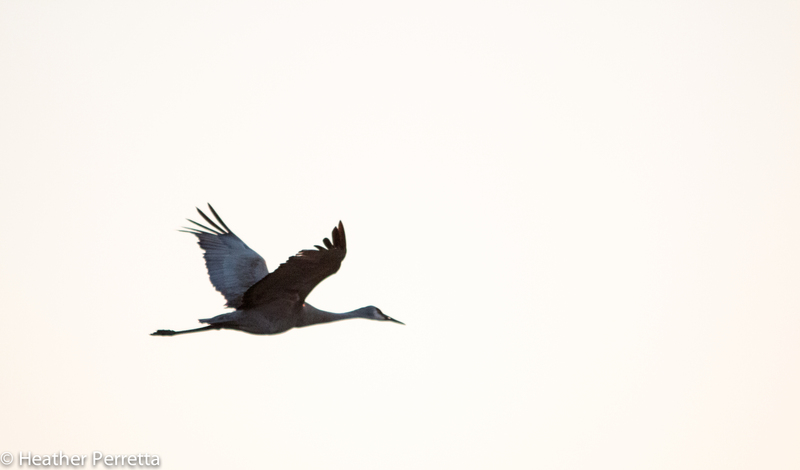 After being with this crane for some time a alert calm washed over me. As I became calmer the crane continued to wander and got much closer to where I was parked. 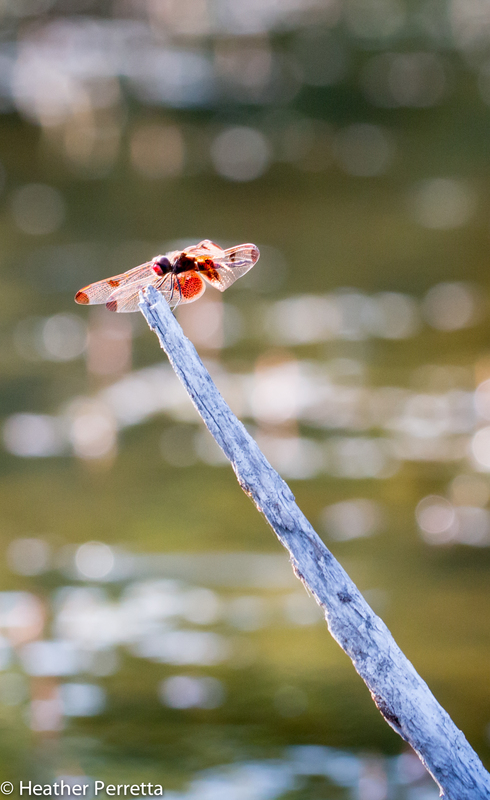 I sat very still and watched. It could hear the clicking of my camera shutter so I decreased the number of pictures I was taking so it could eat in peace. Then in the distance I heard the rattle of buggy wheels and the clip clop of horse hooves. The Amish family who lives nearby makes a nightly tip to the milk house down the road and it was that time. 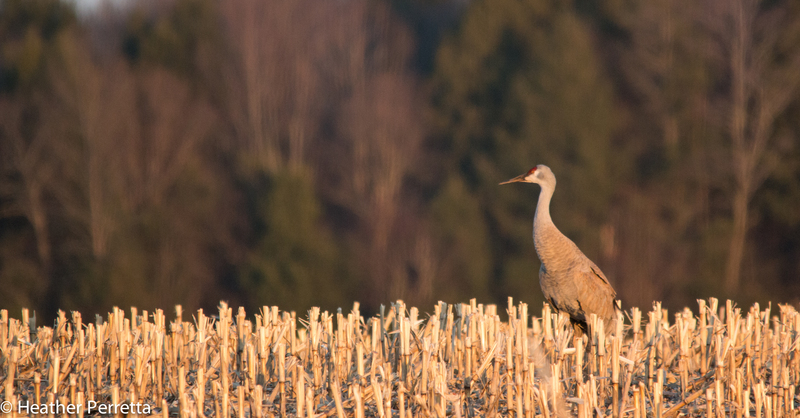 I watched as the crane became keenly aware and interested in the noise that was approaching. It fluffed its feathers and eliminated and we both prepared for takeoff. Amazingly the crane remained in the field while the noisy buggy rattle past. After we were alone once more I realized that the crane was now intently watching me, moving its head to get a better look. I sat perfectly still. I didn’t take any pictures or even lower my head to the view finder. It was an intense few seconds as the crane decided what to do. Then it took flight. Once it was in the air and past my position I jumped out of the car to capture a couple shots of it in the air before it literally disappeared into the sunset. 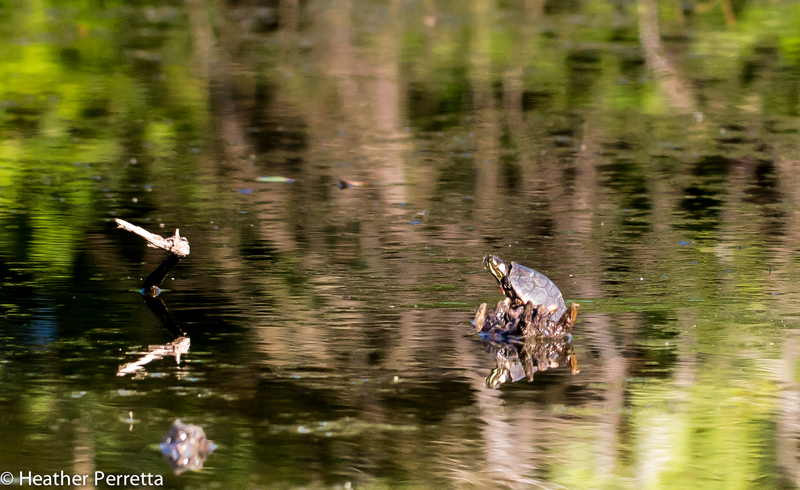 I am grateful every day for the big and small miracles I witness in nature. I am truly honored each time I am allowed to experience the wild beauty that surrounds us. Tonight I feel like the luckiest person in the world! I start each day with a short walk. House are dispersed along our road in what was once open farmland. Some of the fields remain while many large plots have been divided into building lots. This is a typical scenario for this area in Central NY. We lived in another location a little farther north for many years and I was concerned when we moved that I would be giving up the wildlife that I was used to spending my days with. I was pleasantly surprised and often remark how lucky we are to live in such a wild place. 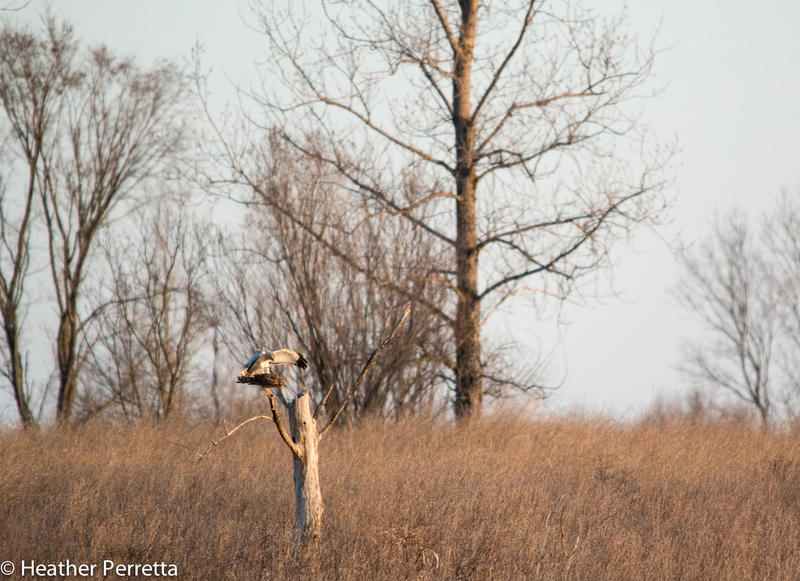 The road, yards, farmland, and streams create a variety of habitats and edge zones where wildlife is plentiful. This morning I saw a many different song birds species, a pair of wood ducks, and a hawk at then end of the road perched on a tree stump. 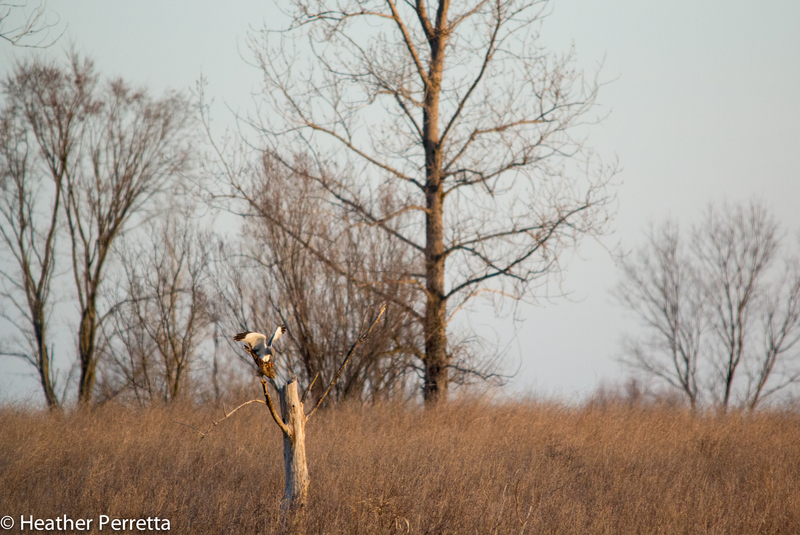 This stump is a favorite perch and I often see raptors sunning there in the morning. 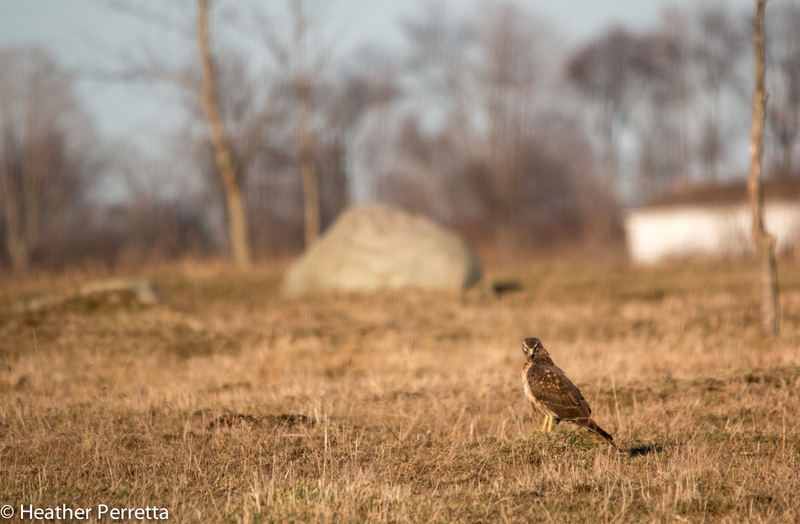 As I stood contemplating and observing the hawk you see below I wasn’t 100% convinced that I was looking at a female Northern Harrier. Her back seemed a little dark and I couldn’t see the distinctive facial disc or the white spot at the base of the tail. 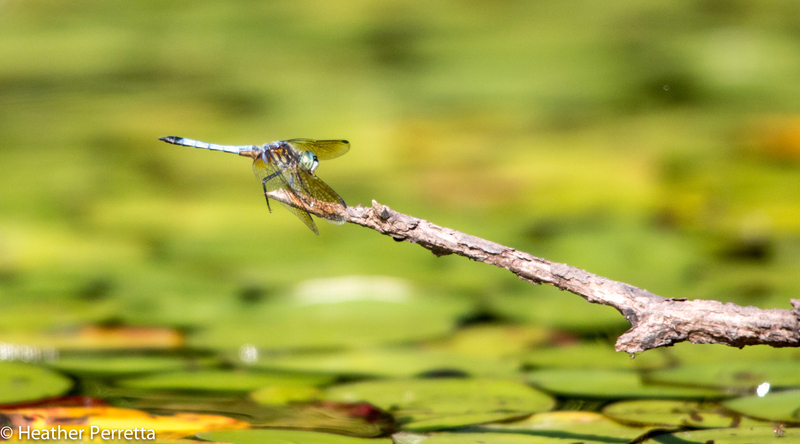 In order for the cloacae to touch and sperm to be transferred the female must move her tail to the side while the males stays on her back and puts his own tail in position. Strong feet hold the pair on the perch. The male departs and female soon follows. 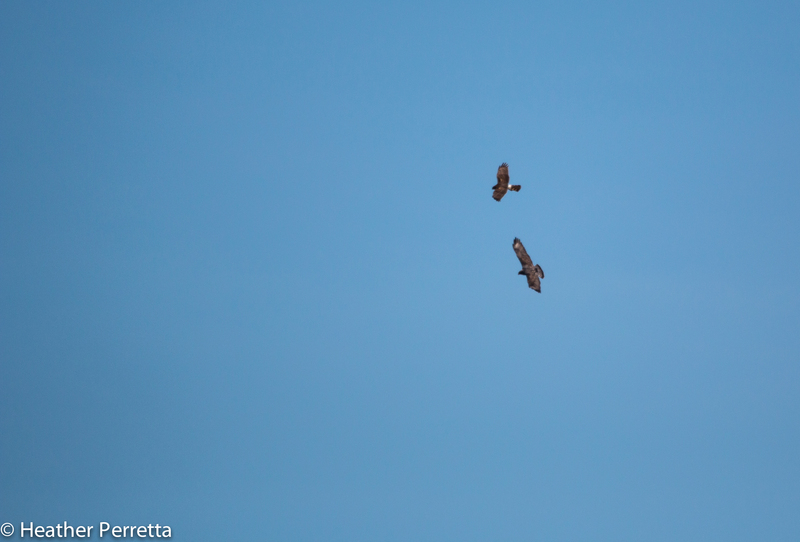 Here is a link to a Cornell Ornithology Lab webpage that gives information about these rather “unusual” hawks. I find it fascinating that a male will mate with up to 5 females in a given area and provide food to all of them while nesting. I wonder how he keeps track of who has eaten. The days grow longer, the temperatures get warmer, and we all begin to feel a shift within us, a lightness. We can smell spring in the air and everywhere we look subtle and not-so-subtle things are happening to remind us that soon there will be an explosion of color as our landscape transforms and the lusciousness that is now hidden beneath the surface is revealed. 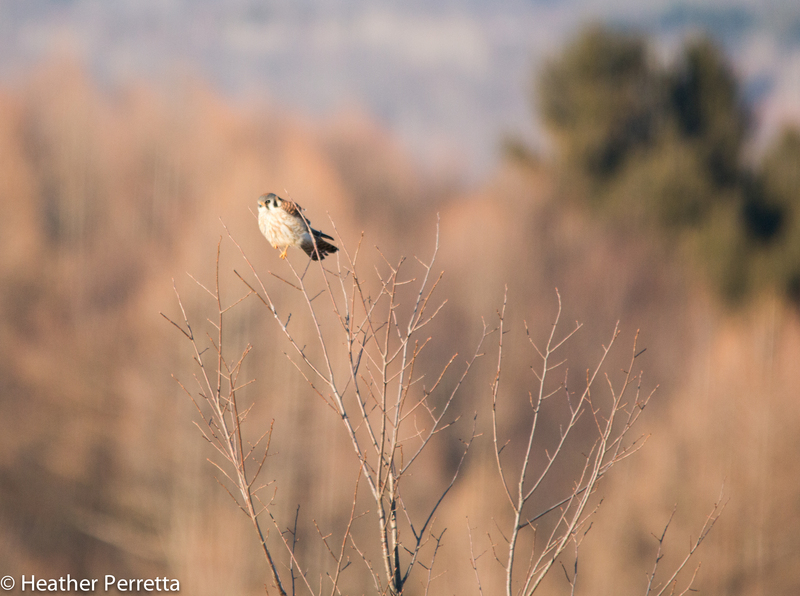 Before the leaves push their way out of the buds in Central NY we are able to see the transformation in the birds. Birds, whether they have been here through the winter or are returning home from a southerly vacation, are looking for mates and building nests so they can raise young and continue their species. Last Sunday a unique opportunity to witness this presented itself while I was on my afternoon pilgrimage to explore and connect with nature. Everywhere I look these days American kestrels are perched on wires, in trees, or flying overhead. 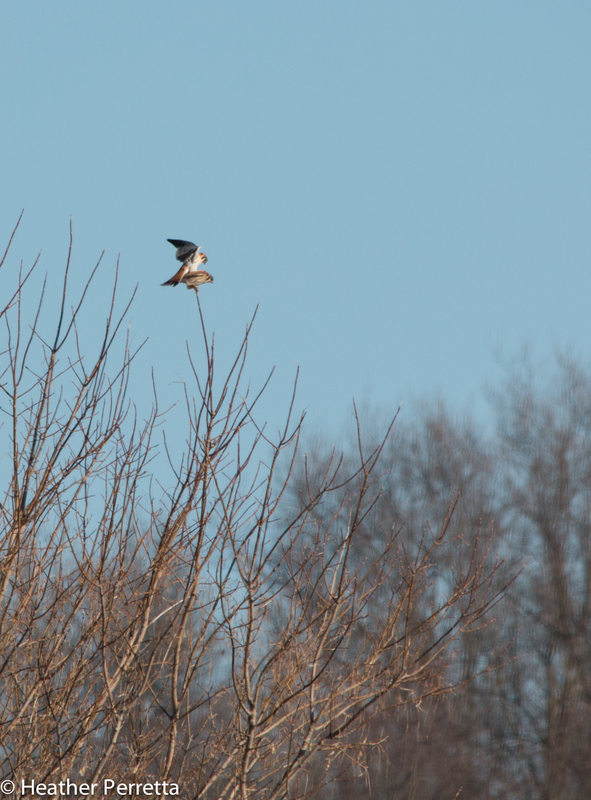 These robin-sized falcons are master hunters and very agile fliers. 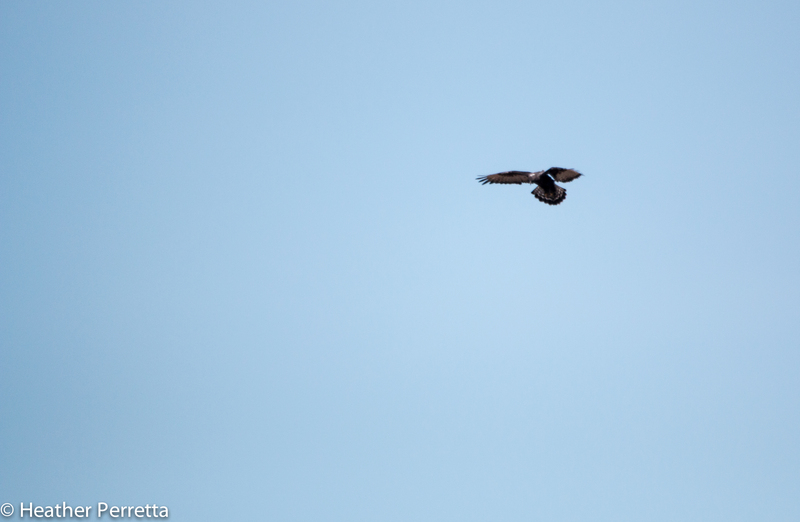 As I drove down the road a small hovering bird caught my eye. Based on the size and behavior I immediately thought it was probably a kestrel so I pulled over. Like a butterfly suspended in air the kestrel flutters it wings to remain stationary over the ground while searching for prey. In this case there was more to this aerial display than hunting. After hovering this male kestrel flew to a nearby tree and perched. Within a minute another kestrel landed in the tree. I was amazed! 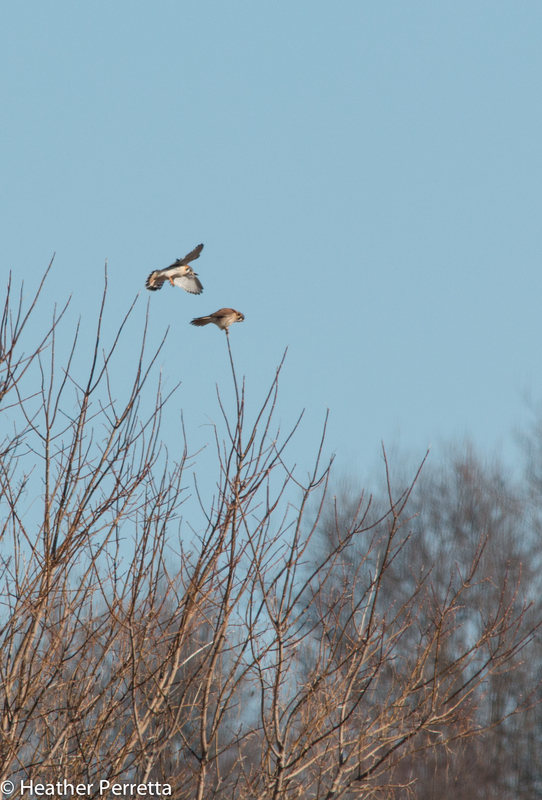 What was the chance that I would get the opportunity to see two kestrels in the same tree and photograph them? Once the second bird flew in front of the male and bowed down a little I began to understand that it wasn’t chance that brought these two birds together, it was mating. 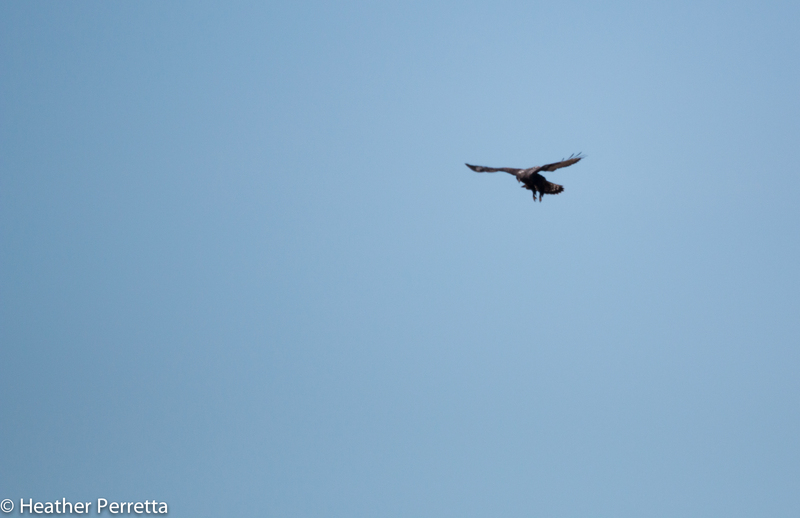 The male flew over and gently landed on her back. She moved her tail aside and mating occurred as the two openings to their reproductive tracts briefly made contact to transfer sperm in what is called a cloacal kiss. 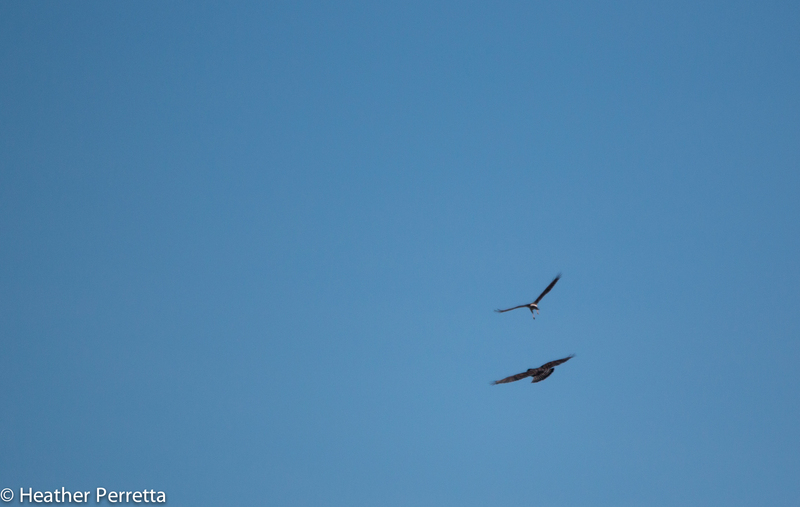 Then the two birds fluffed their feathers and took to the sky. This pair probably has a nest cavity picked out and soon she will lay 4-5 small eggs. After about a month the chicks will hatch and the parents will begin the very demanding task of feeding many hungry mouths. 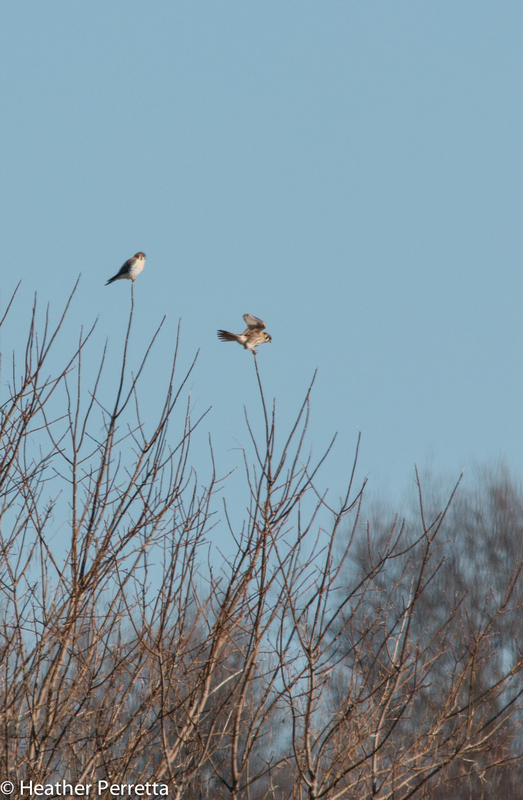 After observing the kestrels I was no longer amazed that these birds had come together in the same tree because mating is a critical part of the cycle of life and it happens every spring. I was, however, amazed and quite honored that I got to witness it. 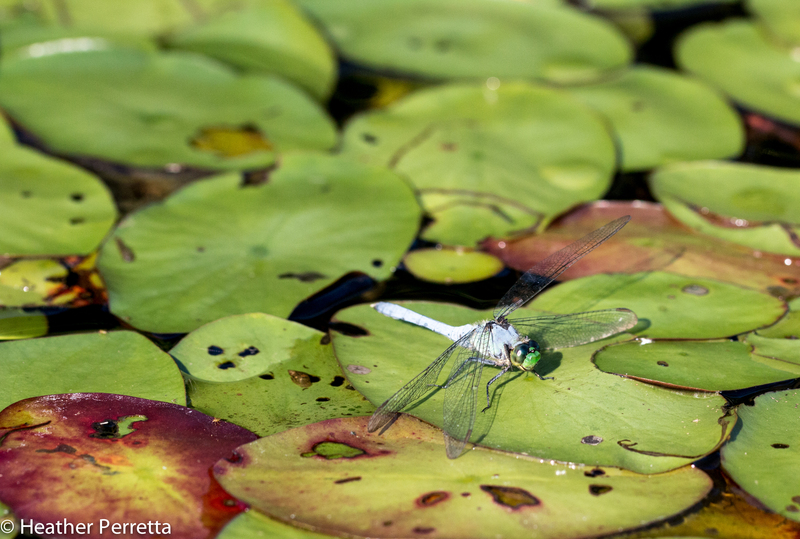 Being a naturalist often feels like being an investigative reporter and the paparazzi. I am constantly on the lookout for the next big story. I observe, record my findings, try to take pictures of interesting and/or intimate moments, and research to back up what I see. I am always on a quest to deepen my understanding and deepen my connection with the natural world. 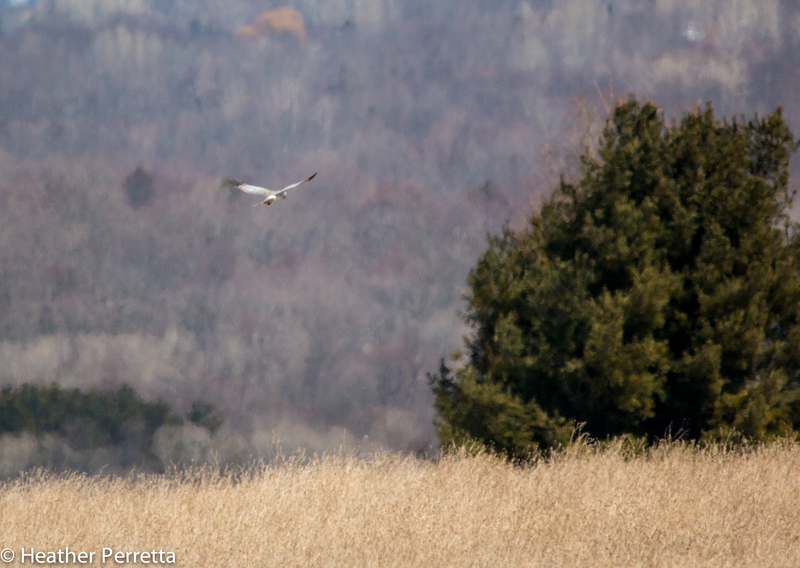 In February I saw a female northern harrier playing in the wind over a fallow field. She disappeared into the cover of the tall golden grasses and I imagined she would re-emerge with a vole in her talons. I waited with my camera ready but she remained hidden in the grasses. 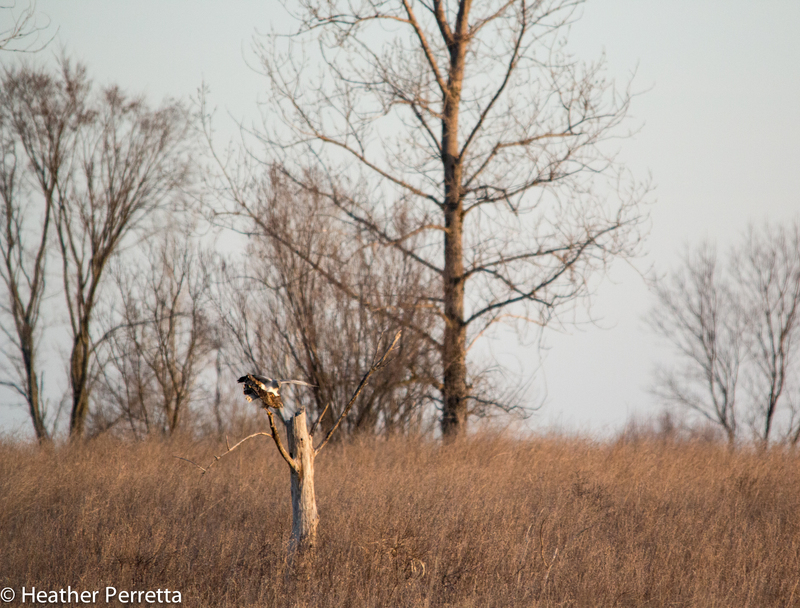 I have not seen a northern harrier in that field again, until today. 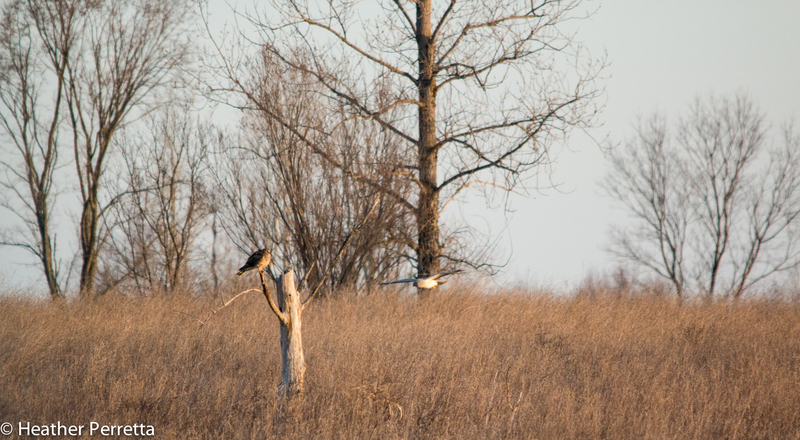 It was mid-day when I spotted a dark phase rough-legged hawk hovering over the sun-kissed field. 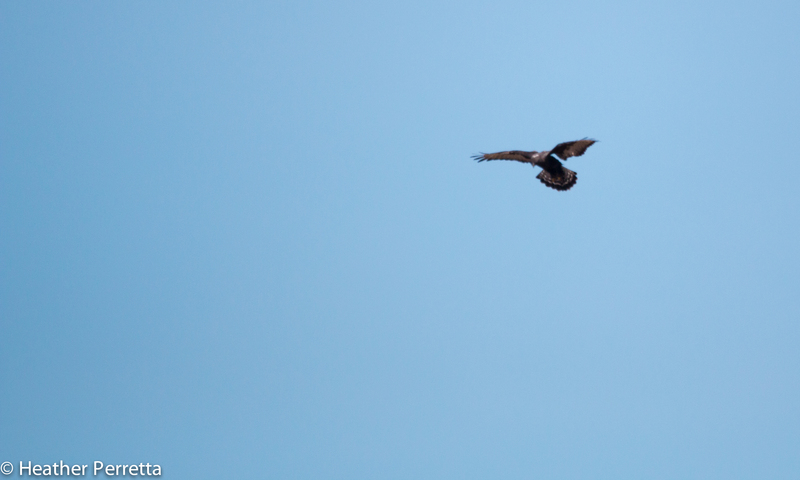 I watched as the hawk maneuvered its wings to hold itself stationary over the ground. It always amazes me how they are able to ride the wind with precision. 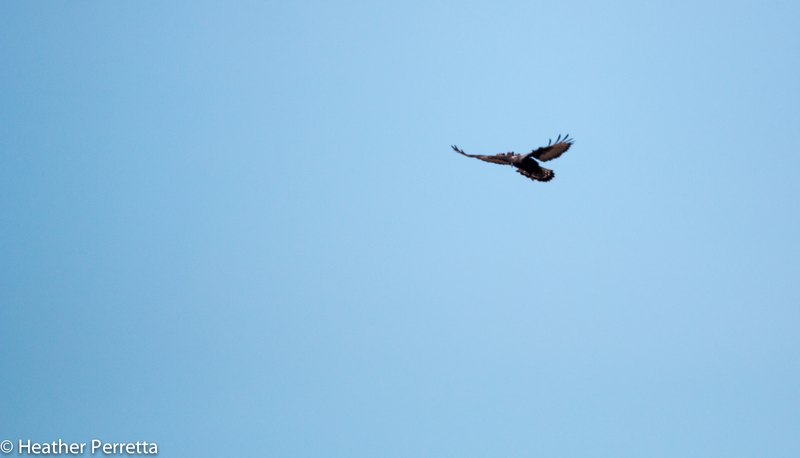 Then another hawk appeared. 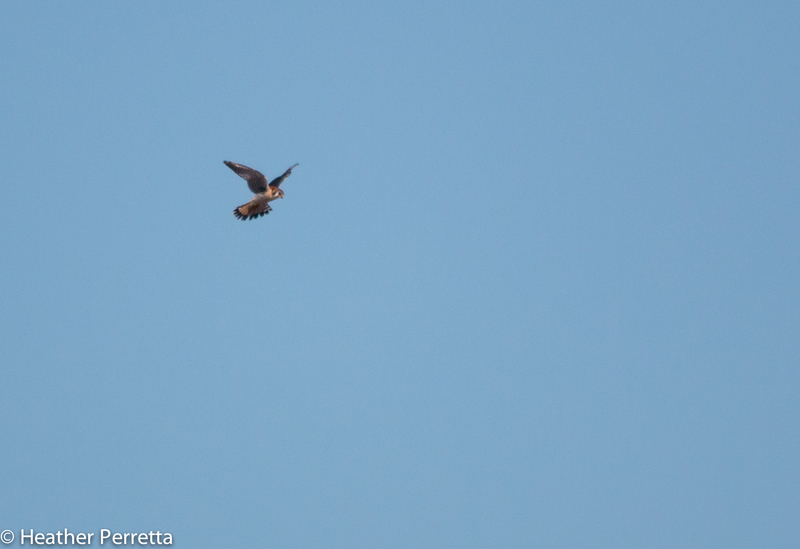 It was an equally adept flyer and apparently an individual the rough-legged hawk had no intention of sparring with. 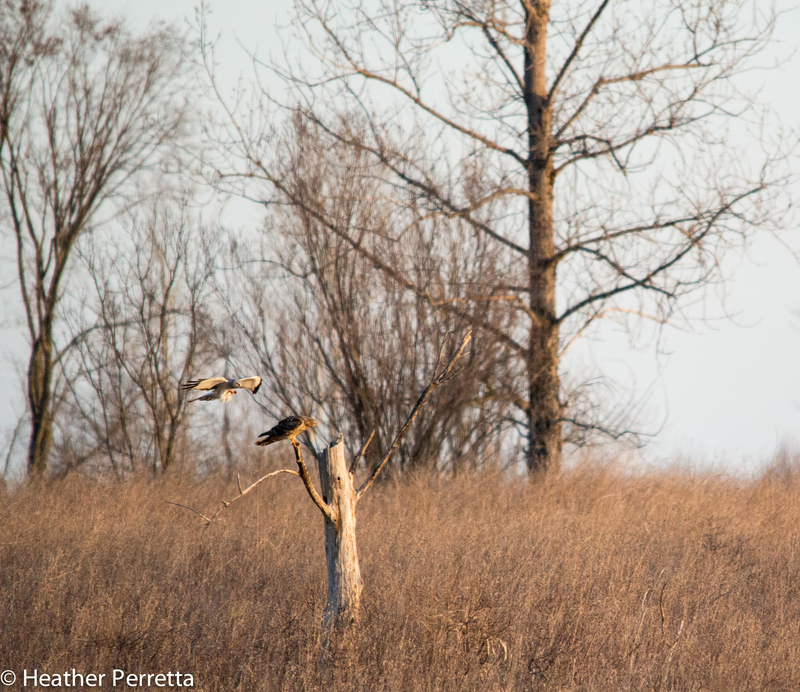 A female norther harrier aggressively flew after the rough-legged until the rough-legged hawk left the area. The female northern harrier continued to fly high over the landscape until she eventually decreased her altitude and disappeared behind a plot of trees. Once she was no longer occupying the air space the rough-legged hawk returned to finish its business. 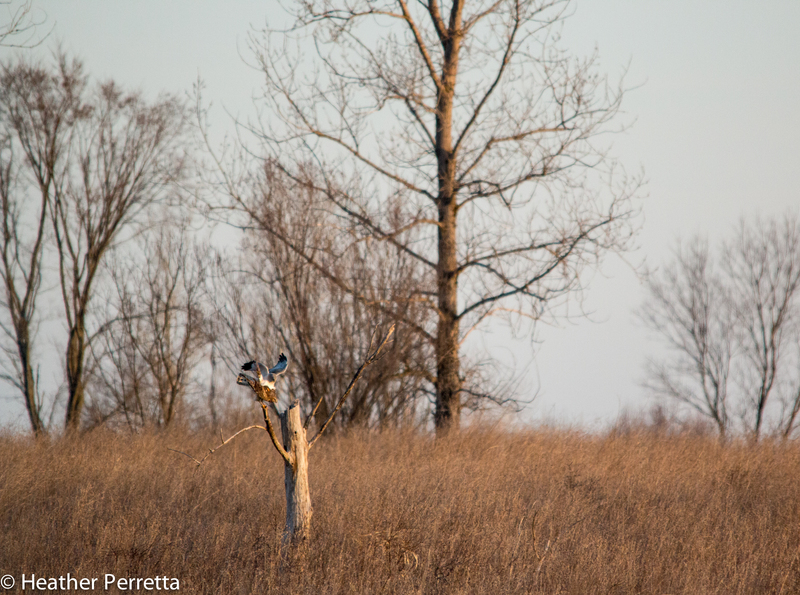 I watched as the hawk fluttered like a butterfly high above a spot in the field and the quickly dropped into the grass feet first. 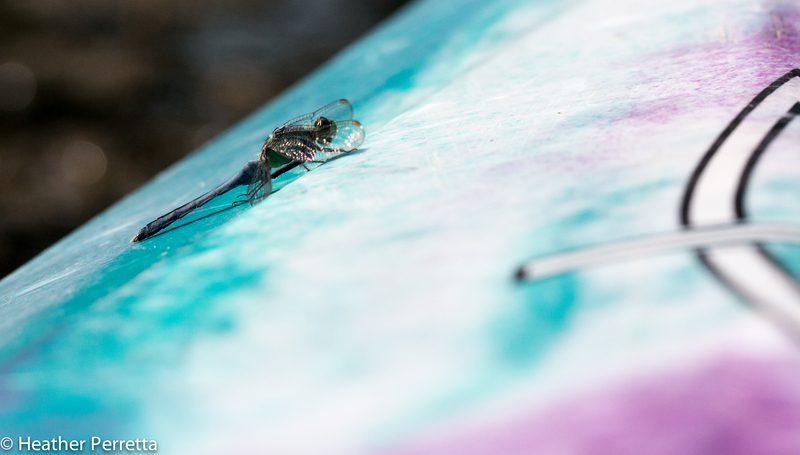 It emerged a minute later with its meal and flew off to eat it in peace. The female norther harrier returned some time later with a male. She was flying high and started off the aerial acrobatics with a steep dive. 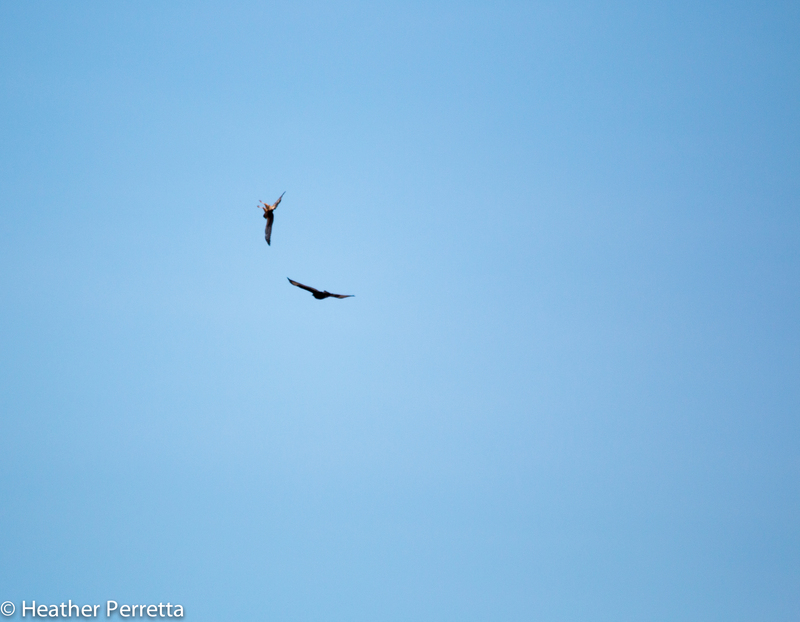 Then he joined in with a captivating aerial display unlike anything I have seen before. 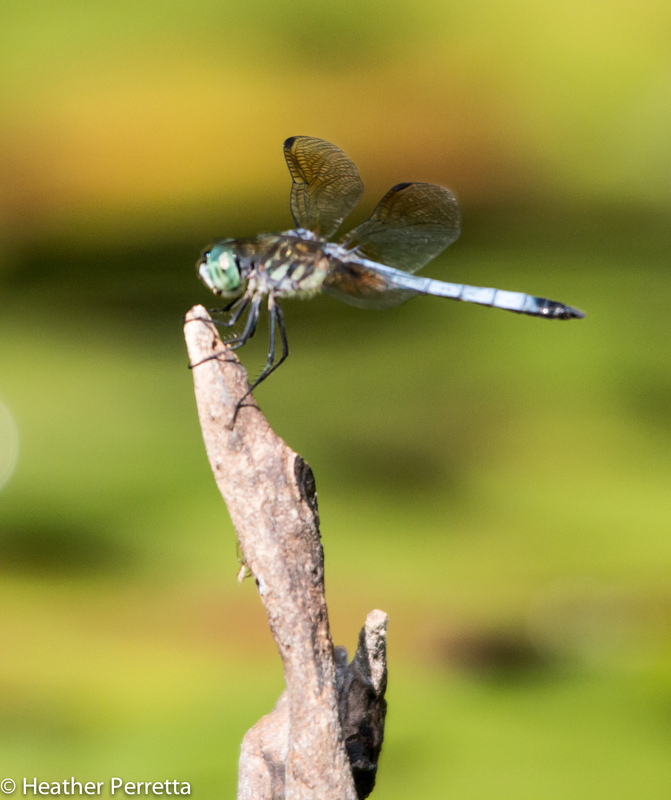 One second he was a small speck in the sky the next he would do a barrel roll, tuck his wings and speed toward the ground only to pull out of the dive at the last second and repeat his amazing acrobatics. I tried to keep up with my camera but the flight was so fast and so erratic that I set it down so I could enjoy the magnificence of what I was seeing. When he was done he landed near where the female landed months ago. 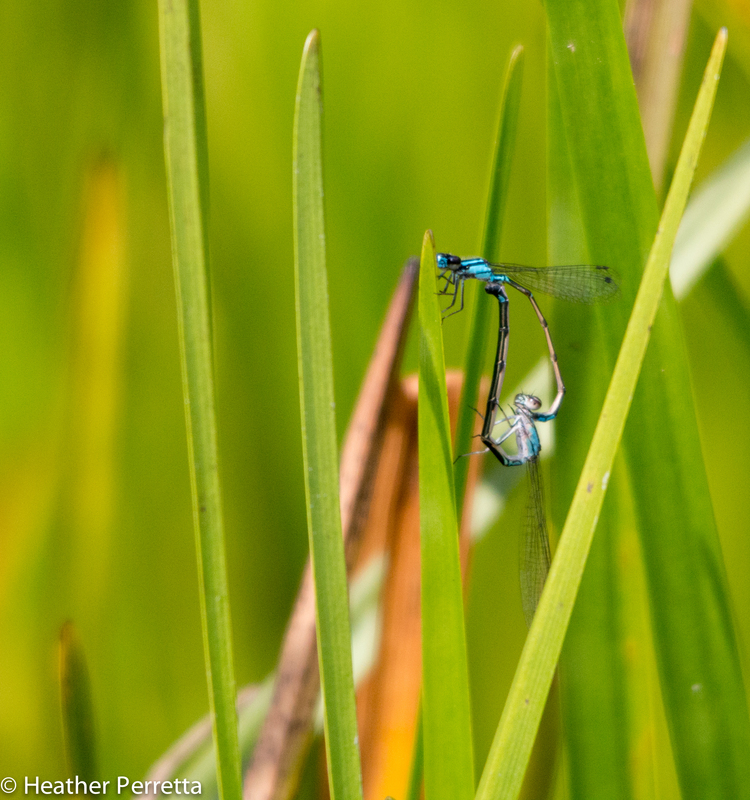 The result of this courtship display could be a nest in the dense grass. It will be interesting to see what comes next. 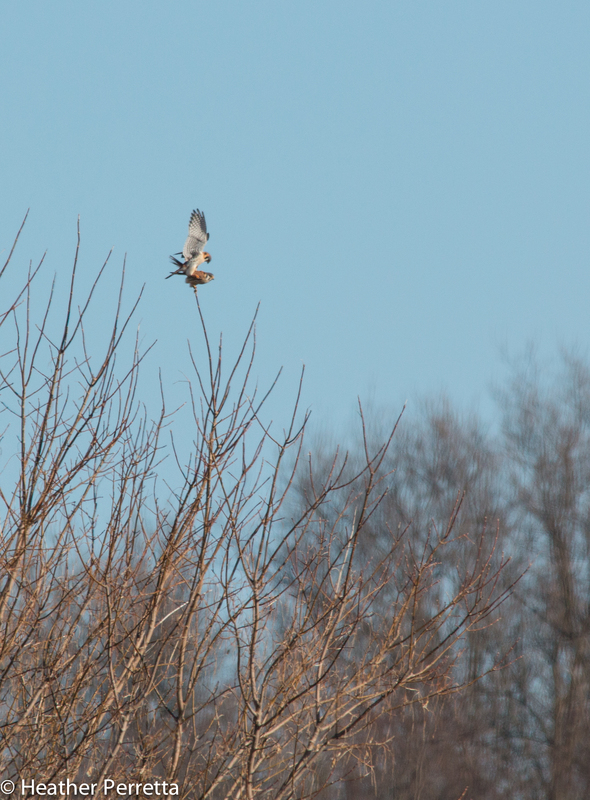 Note: Here is a link to a video of a male northern harrier doing a courtship display like the one I witnessed today. 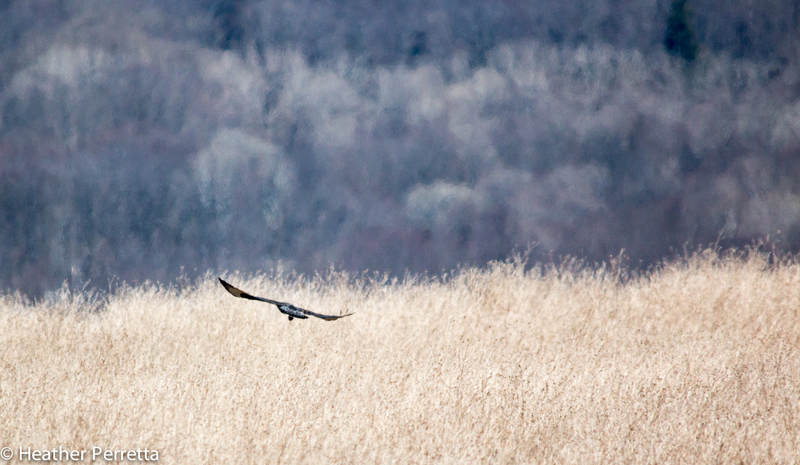 http://www.arkive.org/northern-harrier/circus-cyaneus/video-09a.html Check it out!